Divercity is a two-woman dance/film performance that examines the meaning of country for Indigenous people when they find themselves living on someone else’s country. The result of director Mariaa Randall’s collaboration with a variety of artists, including South Australia’s Nikki Ashby (who can sometimes be seen on TV show Move It Mob Style), Divercity begins in the foyer when the women in the audience are invited into the theatre and the men are asked to wait for 15 minutes. When we are all assembled, we experience a warm, forthright and detailed welcome to country, and it is fitting that the interstate performers (Henrietta Baird and Ngioka Bunda-Heath) acknowledge we are on Kaurna land, given the central theme of the performance. Director Randall is from the Bundjalung and Yaegl people, in far-north-coast NSW, while Baird is from the Kuku Yalanji people in Far North Queensland and Bunda-Heath is from the Wakka Wakka, Ngugi people of Queensland and the Biripi in NSW. 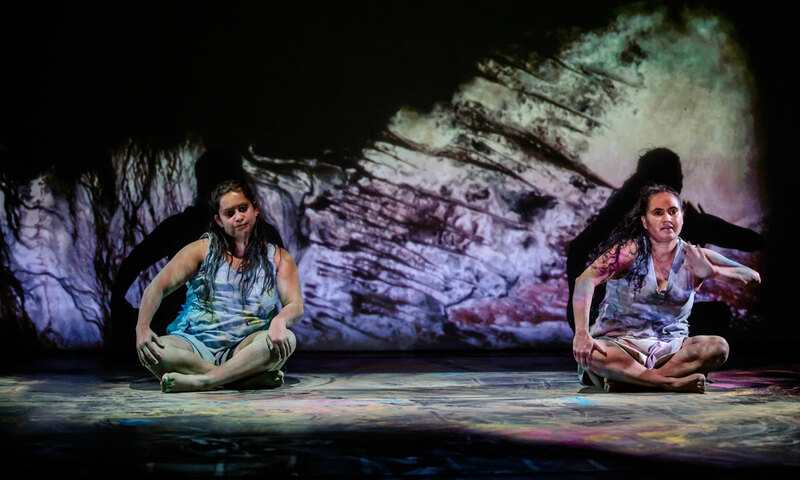 The two performers initially use the floor, with their movements fusing identifiable Indigenous moves with modern choreography; the closeness to the floor represents the attachment to country, especially when red powder or chalk is used effectively to re-create the earth. Individually, then together, the two women move and speak against some fascinating projections. Keith Deverell has done a terrific job in producing visual and sound backdrops which create a distinctively Australian setting that includes mist, caves, rocks and aerial photography. Initially, the images are black and white – a gooey paint dripping, then a rolling smoke that transforms into abstract landscapes. The two performers share childhood memories through fragments of language and recognisable catchphrases which create a connection between them, no matter where they came from. As they mature and begin to dance on their feet, they continue to kick up the dust, a reminder of their connection with country which looks impressive against the projector light, as do the simple costumes. Divercity is described as “… a showcase of dance, language and visual art made up of powder, paint and projection”, and it has some terrific moments, including when all of the women answer a call and take to the stage to perform the dance steps they learned just prior to the start. A performance about connection and belonging, it is a very positive experience. Divercity is at the Adelaide Festival Centre’s Space Theatre until Saturday, November 17.